Saigon, a small town in the southern portion of Vietnam, fell to the Communists and the North Vietnamese Army in the end of April in 1975. 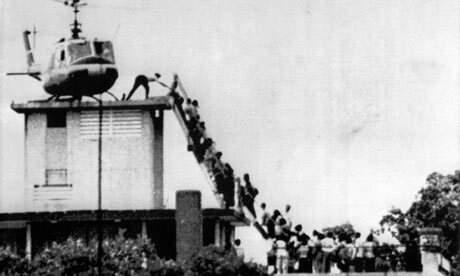 The final city to fall to the NVA, Saigon (later renamed ‘Ho Chi Minh city’) was easily taken as U.S. and South Vietnamese citizens, troops, and refugees evacuated via Helicopter. As the NVA closed in on the city, President Ford ordered ‘Operation Frequent Wind’, which allowed for the evacuation of said civilians and refugees. After the code phrase was broadcasted via radio on April 29th (“White Christmas”), Americans and Vietnamese citizens fled to landing zones to be evacuated by Helicopter. The resulting airlift took place over 18 hours, safely removing upwards of 8,000 civilians and refugees from the soon to be NVA controlled city. As the North Vietnamese moved into the city on April 30th, a rocket attack on Tan Son Nhut Airport killed two Marines. These were the last American Soldiers to be killed in the Vietnam war, and later that day the final U.S. Marines in Vietnam, who had been guarding the U.S. embassy, boarded Helicopters and left the country. 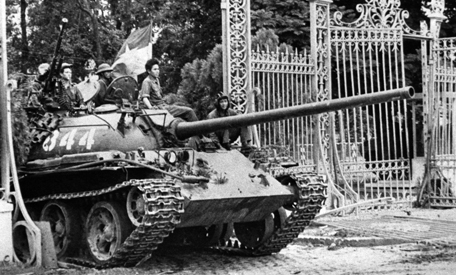 As April 30th came to a close, the Communists had taken control of the U.S. Embassy and Saigon’s Presidential Palace, officially ending the war. Over 58,000 American soldiers lost their lives in this chapter of American History. This was the final withdrawal of American troops in Vietnam. After the approximate decade of U.S. involvement, it ended with this final conflict. As the final marines boarded their helicopters to leave the city, and the Communists entered and took the Presidential Palace, the war was over.